The figures for political parties in the UK have changed significantly in the last few days. Here's an update. Since the referendum, there has been quite a change in party membership figures across the UK, so I thought I'd just pin down what they all are. “Latest estimates suggest that the Conservative Party claimed 134,000 members, the Labour party 190,000 and the Liberal Democrat Party 44,000. *” They also say that, in June, UKIP had 39,000 members. Within this, the Scottish Lib Dems told me today that they have around about 3,000 members, though they added that they've had a “bit of an influx” over the last few weeks, though “nowhere near what the SNP have been having”, and so we should expect a bit of an increase in that number once these new memberships have been processed. The Scottish Conservatives said that they “don't give out membership figures”, though Wikipedia says that, in Ruth Davidson's 2012 conference speech, she claimed 12,000 members. Scottish Labour likewise wouldn't give me any figures, but others have investigated this question before. Caledonian Mercury says that, in 2010, Scottish Labour issued 13,135 ballot papers for the party's leadership election. So it seems reasonable to take that as the membership figure at that date (this excludes members of eg Labour social clubs, but I don't think they can reasonably be counted). I think it's worth asking a simple question to which we cannot know the answer: what was the net effect of the referendum on Labour's membership? And what was the net effect on that of the Scottish Tories? If the vote united Conservatives and split the Labour base then, given the previous proximity of their membership numbers, is it now possible there are more signed up Tories in Scotland than there are signed up Labour members? Of course there are other factors here – UK-wide, Labour had a slight increase after Miliband's election and only a small decrease since then, while the Tories have had a more significant drop. But until both release their figures, we can't know. Peter Murrell, Chief Exec of the SNP is tweeting their membership figure every few hours. It's still rising fast, but as I write, it's 62,870, making them easily the third biggest party in the UK. To put that figure in context, that's 1.5% of the Scottish electorate – a higher density than every political party in England combined. It's 1,065 members per Westminster constituency, on average. Plaid Cymru has also seen a bit of an increase in membership since the referendum, with, they tell me, 220 new people joining in the week since the 18th of September. Their membership in 2012, after a 25% surge upon the election of Leanne Wood as leader, was approaching 8,000. So I assume it's now passed that figure. This takes the combined figure of the SNP and Plaid over 70,000 – meaning that, between them, they have more than half as many members as the UK Conservative Party. The Green Party of England and Wales told me on Monday that they have “460 new members in the last week, or 960 in the last three weeks, 1,000 new members since Autumn Conference, 40% membership growth since January 1st.” They expect to pass 20,000 in the next month. 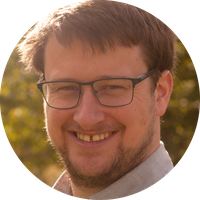 It's not clear whether the sudden increase was a product of the referendum or the Labour conference – two of my friends joined last week, one triggered by each. 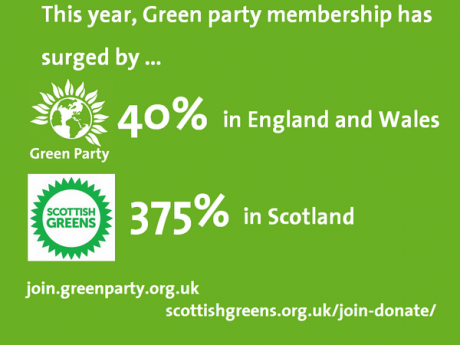 The Scottish Green Party has, at the time of writing, just passed 6,000 members, but, like the SNP, this is growing fast. This means it's about twice the size of the Scottish Lib Dems. To put this figure in context, that's 0.16% of the electorate. The UK Lib Dems have 0.09% of the UK electorate as signed up members. This means that (along with a couple of hundred or so Northern Irish Greens) the Green Parties of the UK have around 26,000 members. In December last year, this figure was around 15,000 (which, bizarrely, is the figure the House of Commons library used, despite having up to date SNP numbers). Of course, in itself, membership increase isn't a guarentee of electoral success. But it is an interesting indication in itself of the relative significance of the parties, and the direction of travel does perhaps tell us something about their future fates. Anthony Barnett has now written a quick piece adding some important context to this. *update: I've been pointed to the exact Lib Dem figure from 29 July of 43,451 - I should say, while I'm at it, that credit is due to them for being the only one of the "big three" Westminster parties to be open about their figures, even though they are the lowest.